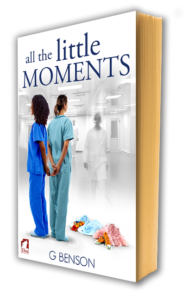 All the Little Moments (2015): A successful anaesthetist, Anna is focused on herself, her career, and her girlfriend. Everything changes abruptly when her brother’s and sister-in-law’s deaths devastate her and her family. Left responsible for her young niece and nephew, Anna finds herself dumped and alone in Melbourne, a city she doesn’t even like. She tries to navigate the shock of looking after two children battling with their grief while managing her own. Order “All The Little Moments” at Ylva Publishing.